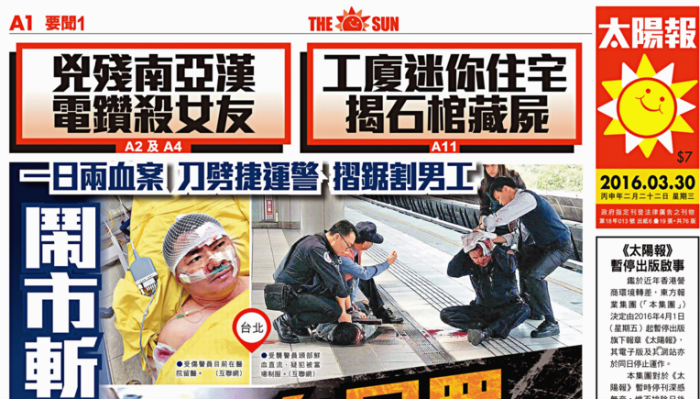 The Sun, the broadsheet Chinese-language daily under the media empire Oriental Press Group, will cease publication from Friday due to the “deteriorating business environment”. The publishing firm said in view of the recent deteriorating business environment, it has decided to suspend the publication of The Sun, together with the operation of both electronic version and website, with effect from 1 April. First released in March 1999, the paper started as a cheaper alternative in the news market with a cover price of $2, while other papers at the time were selling for around $5. Following the suspension, the group stated that it will reallocate its resources and focus on strengthening the development of its other businesses. However, the company said it does not “preclude the possibility of resuming publication” if the economy and the business environment improve in the future. The group’s announcement did not mention if there would be any lay-offs or how many staff members would be affected. However, RTHK reported that some 300 staff could be affected, and some would be transferred to other jobs internally. Good News, a free weekly supplement published every Friday along with The Sun, will also be ceased publication at the same time. Carat has appointed Cathy Kuang to take on the role of managing director for North China, based in Beijing. ..